CSC 320. 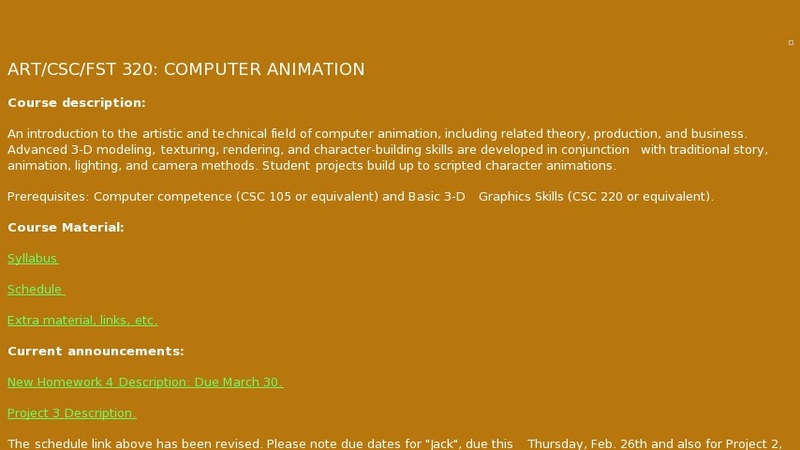 (ART 320) (FST 320) Computer Animation (3) Prerequisite: CSC 220 (ART 220) (FST 220) or permission of instructor. Basic principles of animation using 3-D computer-generated animation and basic processes for animating synthetic objects through structured exercises. Principles of designing and producing 3-D computer-generated animation through the creation of advanced motion studies. Projects focus on developing higher-level skills in model building, animation and color, and lighting.